There are two launches on different sections of the ridge. The first, Lower Bates, is a SSW facing cliff launch in a slot between bushes about 50 above a strip of beach. The wind is frequently somewhat cross and turbulent at this launch. The other launch, Upper Bates, is a gentler (about 1:1) south facing grassy slope about 300 feet above the beach a few hundred yards west of the lower launch. While this launch tolerates a broader range of wind conditions, it is set back 100 - 200 feet from the beach with power lines and railroad tracks immediately below on the way out to the beach. Both launches have plenty of set up area adjacent to parking. The nominal LZ for Bates is the beach below launch. The beach is essentially unrestricted, but has the usual problem of wandering spectators to be avoided. In addition, the beach can become quite narrow during high tide conditions. Make sure to check out the width of the beach before committing to a landing at this beach. Any. Paved road to lower launch. The paved road to the upper launch ends a few hundred feet before the set up area and crosses a high berm onto a large dirt parking lot. Vehicles with low ground clearance may need to be parked and pilots hike the last bit in. The site is not officially regulated, but this may be changing. During 1993, the extensive use of the site for paragliding training led to some conflicts with local police. Hang Gliding is OK for the moment, but landing on the beach may lead to a citation. Check with the Topa Flyers for current info. In any case Intermediate level skills (and windy cliff launching techniques) are required to fly this site. This site is soarable in westerly pre/post-frontal conditions - often the same as are good in Santa Barbara. Frequently Bates will appear too calm on arrival but will suddenly improve. Because of the local topography the wind conditions may change abruptly in the region of Bates, so look for wind lines on the ocean moving in toward shore indicating such a boundary is about to pass. It is frequently possible to transition from the Bates ridge to the main Rincon Ridge in back and head XC east southest toward Ventura. The first 1.5 miles of this flight are DEVOID OF LZs (i.e the side of a cliff, the freeway or the surf). Unless you are experienced at this site you should not try to make this jump with less than 700 - 800 feet altitude. Once beyond this first section there are a variety of small LZs near the freeway. 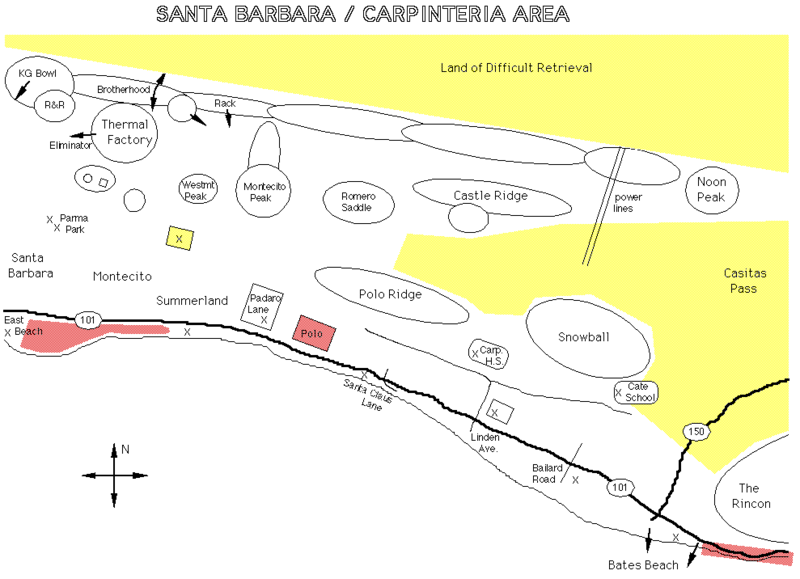 For Lower Bates take 101 to the Bates Road exit in Carpinteria. Go south to the edge of the gated community and turn right into the parking lot. Launch is at the cliff across the lawn from the parking area. For Upper Bates go one exit further NW to the Rte. 150 exit and go south until the road ends in a T. Go left for a few hundred yards and the road will end in cul-de-sac. Launch is across the large dirt lot to the right.